Last minute preparations are well under way for Saturday evening (2nd Feb), at Portmore Equestrian Centre. In the days leading up to the masterclass, Geoff Billington, Olympic showjumper, is booked up with training clinics for various groups of riders. The masterclass will start at 7pm and the first part of the night, will involve four demo riders from across Ireland varying in experience in both rider and horse. Brand Ambassador for Bluegrass Horse Feeds, Kenneth has been riding from a young age and grew up at Lenamore Stables which has been run by the Graham family for over 100 years. Kenneth has had amazing success both in Ireland and across seas. In 2018, Kenneth had continuous success, including finishing 3rd in the National Crusing Championship at Dublin Horse Show and wining the Ulster Region Grand Prix at Antrim Show along with many more. Young rider Mackenzie started riding when she was three and hasn’t left the saddle since. Moving up to horses and competing all over Ireland, Mackenzie’s success is growing each season. One of her proudest moments so far was coming 2nd in the Junior Nation Cup at Hagan in 2017. A Bluegrass Horse Feeds Brand Ambassador, Mackenzie manages to balance her school books and showjumper career to a “T”. Vickie has been riding from a young age and works hard to compete whilst working a full-time job in her family owned business. In 2018, Vickie competed at Hickstead and is competitive at 1.45 level. Vickie is travelling from Co.Laois with her 6 year old gelding Classic Adelheid Z (Ivor), to be our 3rd demo rider on Saturday evening. Jessica started riding at the age of three, and with both parents having eventing up to international level she always had success in her sight. She has competed in three international events including her highlight of 2018, finishing 2nd at Millstreet International Horse Trials. Since transitioning to Show jumping in September she is looking forward to an exciting season. Jessica is bringing along her 8-year-old gelding Fabio to the masterclass on Saturday, it’s a new partnership having only owned him since October. With such a great line up, the masterclass is sure to be entertaining. 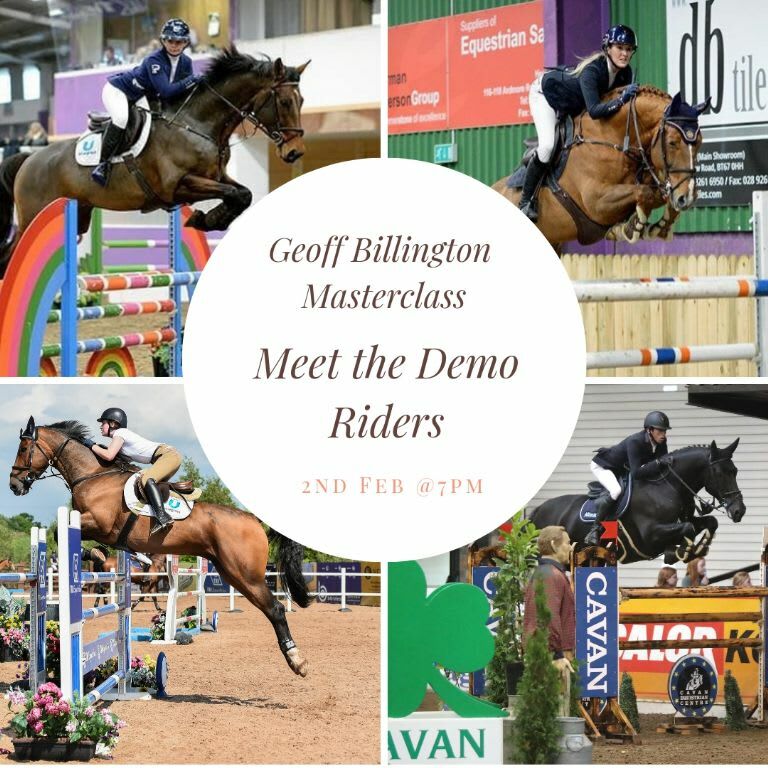 In part one “Improving your riding”, Geoff Billington will be using the demo riders to allow the audience to engage and learn from what Geoff observes from each rider and horse and how they can improve. In part two, Geoff will be riding a range of horses, “doing it my way”. If you have watched Geoff before, you will know his comedy and witty personality will guarantee an evening of entertainment.